The BAW inductive distance sensor. THE BAW inductive distance sensor with digital interface uses analogue circuitry to detect distance changes and outputs them digitally with 4-bit resolution. 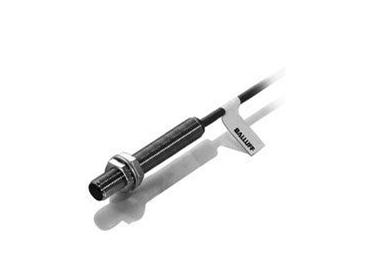 It is available from Balluff-Leuze Pty Ltd .
Where previously the sensors themselves had to be mechanically shifted to indicate different switching points, this can now be done easily and conveniently in software. External set point controllers are no longer needed - and definition of the various switching points doesn't require the sensor to be moved. The sensor has a 4-bit output. This provides for 16 different bit patterns. At positions below 1mm the bit pattern is "0000" and in the range beyond 5mm the pattern is "1111", each representing "Out-of-Range". The remaining 14 bit patterns divide the measuring range into 14 sub-ranges of equal size. Switching points that used to require cumbersome manual setting and adjusting can now be defined in software and changed quickly and flexibly as needed. The digital interface offers noise-immune transmission and works without any additional external devices such as analogue input cards in the PLC or other devices for processing analogue signals. A further, already proven functionality in the group of distance sensors is the ability to measure temperature changes near the sensor. The required position accuracy is achieved by measuring the ambient temperature in the sensor at the front of the coil and considering this signal during the internal signal processing. The temperature signal itself is also provided to the customer separately for further processing as needed. Uses for the BAW are various and can be found in innumerable industrial applications such as distance sensing or thickness measurement. The sensor handles positioning and position checking as easily as monitoring tasks or selecting different sizes and materials.